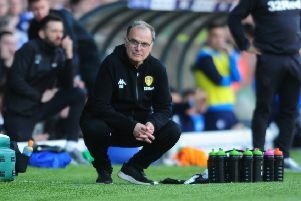 Uwe Rosler today hit out at speculation over the future of Sam Byram, insisting again that Leeds United have received no offers for the 21-year-old. Rosler said he was fighting to “protect” Byram from transfer rumours after a summer in which the academy product has been repeatedly linked with a move away from Elland Road. The talented defender - a player who Rosler is planning to use as a right winger this season - has developed into one of United’s most valuable squad members but he is out of contract in less than 12 months after failing to agree a new deal before Christmas. Leeds, who value Byram at a sum in excess of £5m, have shown no sign of selling him however and the club look increasingly likely to keep him beyond the end of the transfer window, despite interest from Everton and Newcastle United. Byram has been at the forefront of Rosler’s plans during pre-season and the German said he was anxious to prevent a “happy” Byram from becoming unsettled. “Being a player myself who went through similar situations, it’s not helpful for the player or for us when people stir things up,” United’s head coach said. “I can only repeat myself: we have no offer, no written offer and no approach. “He’s a young boy and he’s probably not been through this before. Imagine how much it could influence him. I just ask for no unnecessary speculation. There’s no enquiry, there’s no bid whatsoever on the table for Sam Byram. “I know he’s happy but my job is to protect my players and to keep my players focused 100 per cent. I’m not saying he’s not focused. I’m just saying it could have some sort of impact. That’s human nature. United start the Championship season next weekend and have entered the last month of the transfer window, with FIFA’s deadline set to fall at 5pm on September 1. Rosler, however, confirmed again that Nicky Ajose would be moving on from Elland Road after the forward was missing from the new list of squad numbers announced by Leeds this morning. Ajose, who joined on a three-year deal from Peterborough United last summer, did not travel on Leeds’ pre-season tour of Austria and Norway and has been told to look for a new club. Rosler said: “I spoke to Nicky before we went to our training camp. Nothing has changed. “I feel I can’t guarantee him the playing time he probably wishes for and it’s better for both parties if Nicky tries to find himself a new club.